The Avenue of Flags was dedicated during ceremonies at Miramar National Cemetery on January 28, 2012. 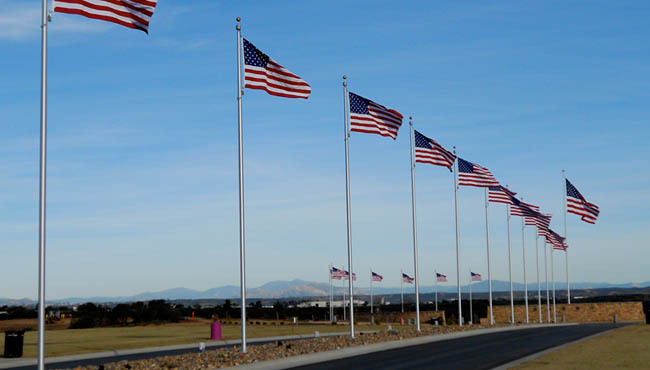 The inspiring display features an array of 50 flagpoles that line the Cemetery’s main drive. It was made possible by a generous contribution from North County Supervisor Bill Horn and the San Diego County Board of Supervisors. Your tax-deductible contribution to the Foundation will help continue the effort to honor our nation’s veterans in their final resting place at Miramar National Cemetery. The Foundation’s mission includes administering memorial trust funds, conducting commemorative ceremonies, enhancing and beautifying Miramar National Cemetery, and financing and erecting memorials to honor veterans’ organizations. To make your tax-deductible contribution to the Miramar National Cemetery Support Foundation, a 501(c)3 non-profit organization, please follow the link to the Contributions Page to complete your contribution.